More importantly, perhaps, it actually lets you make yourself look more attractive on video chat. The company already has five patents pending for its technology, related to the code it has developed for video face-tracking and its unique set of filters that work on mobile in real-time. While similar sorts of technology have been available on the desktop for adding avatars over top your face while chatting over webcams, we haven’t seen a lot of experimentation in this area on mobile, despite the popularity of video calling tools like Apple’s FaceTime or Skype, for example. (Some video calling apps, like Tango, come to mind as an exception). However, notes Looksery’s co-founder Victor Shaburov, many prior efforts at face-swapping appear “amateur-ish” and don’t move all that smoothly. There are a lot of silly things you can do with Looksery, the company says, like being about to “trigger” a different face avatar by making a particular facial expression. For example, if you open your mouth wide, you could transform yourself into a roaring zombie. You can also turn yourself into a skull, a scary face, an animated bear, or an x-ray. But Looksery’s feature set isn’t only about joking around. It also offers tools that let you give yourself eyes of a different color. 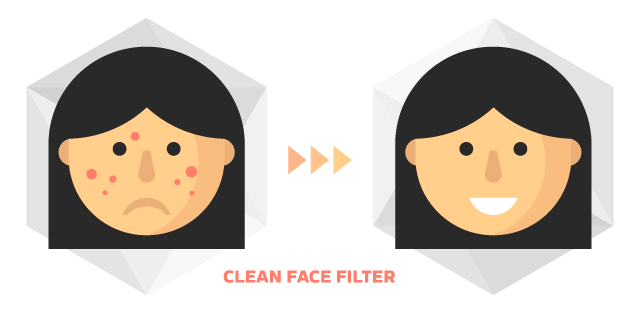 Or you can make yourself look all-around better, with specialized filters that let you soften your skin, give yourself a thinner face, change your chin and neck shape, change your nose size, make your eyes bigger, and even remove your pimples. Better, digital versions of yourself aren’t just for science fiction movies anymore, it seems. Another interesting part to the software is that the real-time video it sends are smaller in size. “When people talk with each other using 3D characters, we don’t send video in this case – we send a manifest [the file showing the avatar displaying the emotion] …which is like 2% of the [size of] the original video. This makes video communications very fast,” says Shaburov. The team is now working to do similar optimizations with person-to-person chat, which is possible because the software can tell which parts of the face are moving and which aren’t. Looksery’s consumer app is only one avenue the company is exploring, and if anything, serves as a demo of the technology it wants to license to other businesses, including call centers, HR software makers, handset manufacturers, mobile carriers and other third-parties. The team is already in discussions with a few OEMs today, but deals aren’t signed. The San Francisco-headquartered team of 15 is self-funded for now, as it goes to raise $30,000 on Kickstarter. Early backers will be the first to receive the iPhone app (Android will come after), and will receive the filter packs at a discount, before Looksery is more broadly available later this fall.